Once you purchase, download and install any of our premium add-ons, you need to activate its license key to make sure you can benefit from the free updates and premium support that come with it. Here's how to activate your license keys. 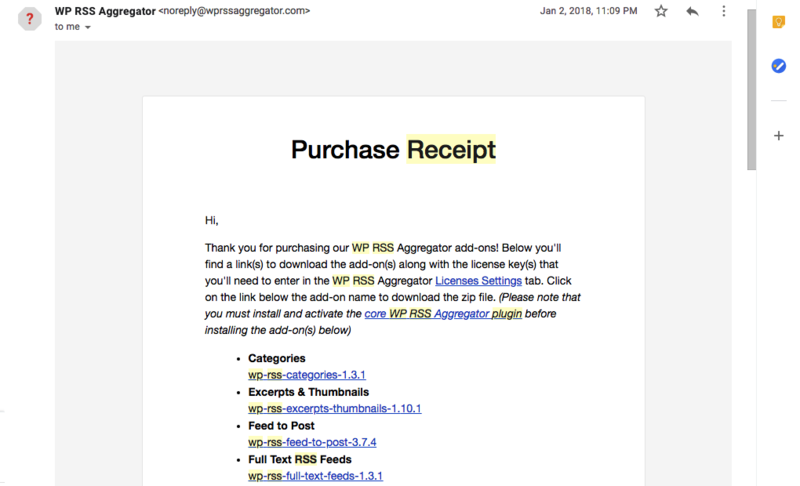 Go to either your Purchase Receipt email or your WP RSS Aggregator account. The email will display the license keys in the License keys section, while the account will display them all in the License keys tab. Highlight and copy the license key (ctrl+C or cmd+C). Go to your WordPress site's dashboard and click on RSS Aggregator in your sidebar menu. Visit the Settings section under RSS Aggregator and click on the Licenses tab. Paste the license keys in the appropriate box and click on the Activate button. Congratulations, your license key is now active! Updates will appear as soon as they are available, and you are entitled to premium support for the licensed add-on on the website in question. If for whatever reason, the license is not activating or being marked as Invalid, please check out the possible causes here.